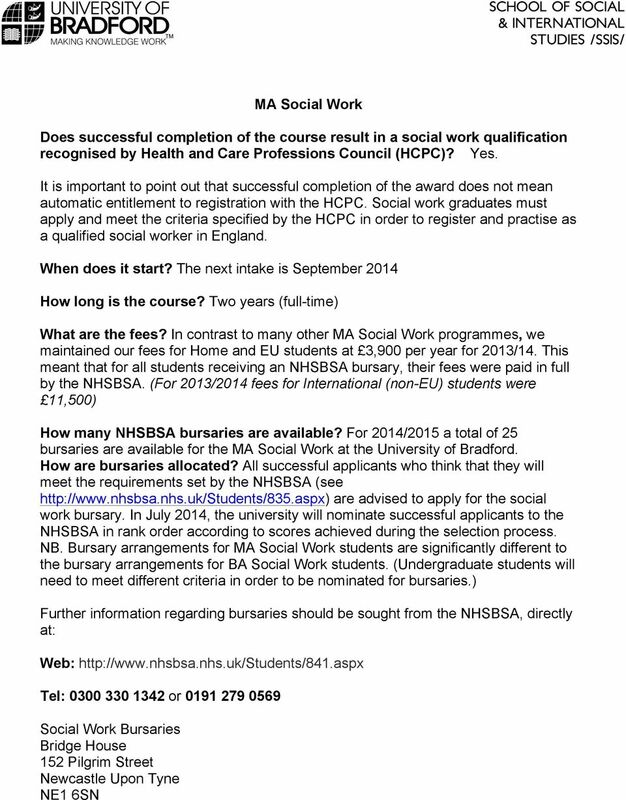 Download "MA Social Work. When does it start? 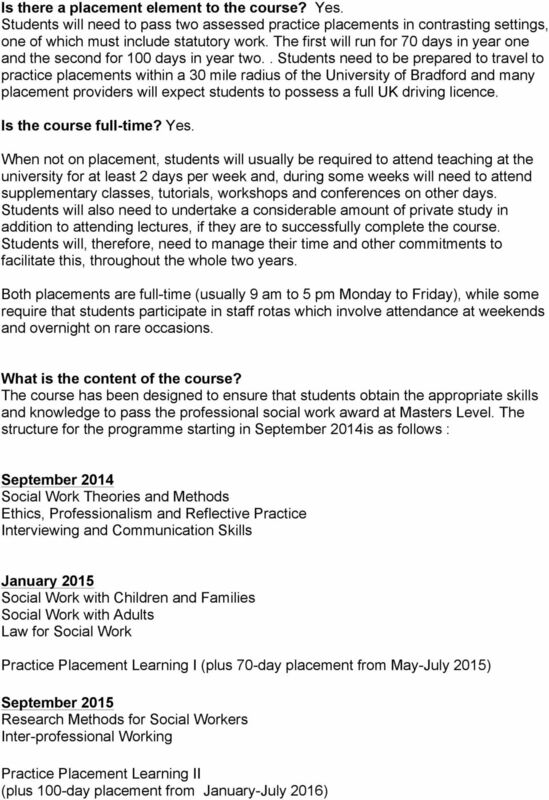 The next intake is September 2014. How long is the course? Two years (full-time)"
2 What are the admissins requirements? We require successful applicants t: - Nrmally pssess an undergraduate hnurs degree at 2:1 r higher. (Applicants with 2.2 degrees wh have subsequently btained a Master s degree r PhD will als be cnsidered.) Demnstrate that, by the time they start the curse, they will have acquired current and relevant underpinning knwledge frm psychlgy, scilgy and scial plicy, at a level, which will allw them t cmplete the MA (Scial Wrk). Applicants wh have nt acquired such knwledge in cmpleting their first degrees r wh btained their degrees several years ag shuld cnsider what further study and/r reading is required as well as study skills revisin t prepare them fr this level f study. They may need t cnsider enrlment n fundatin level curses at their lcal university r distance learning packages, such as the Open University s Intrducing the scial sciences Demnstrate that they have relevant wrk experience equivalent t a minimum f 6 mnths full-time wrk (apprx. 910 hurs). This may be paid r vluntary wrk and culd have been undertaken n a full-time r part-time basis. 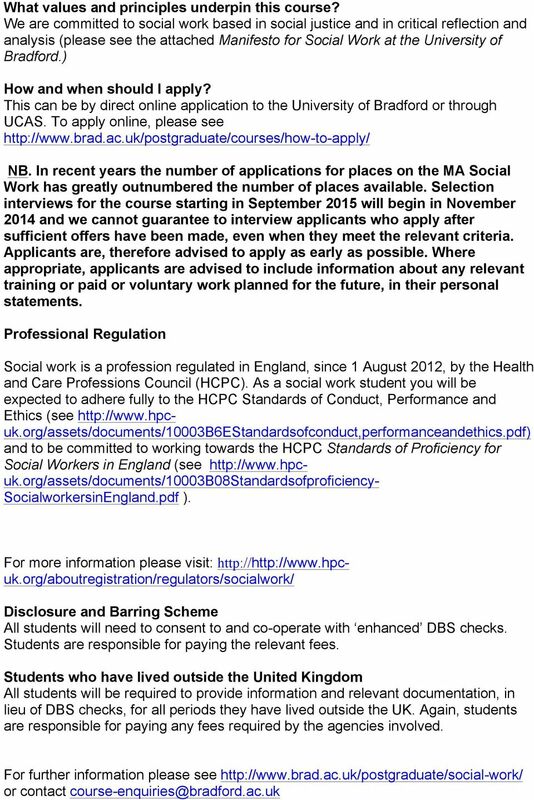 Applicants are usually expected t have had a substantial part f such experience during the past 2 years and t have had experience which includes wrking with vulnerable grups in Britain. Applicants wh have limited experience r wh have had little r n relevant experience during the past 2 years shuld cnsider seeking relevant emplyment r vlunteering via rganisatins, such as their lcal Cuncil fr Vluntary Services, lcal Children s r Adult Services Departments r lcal vluntary sectr agencies. 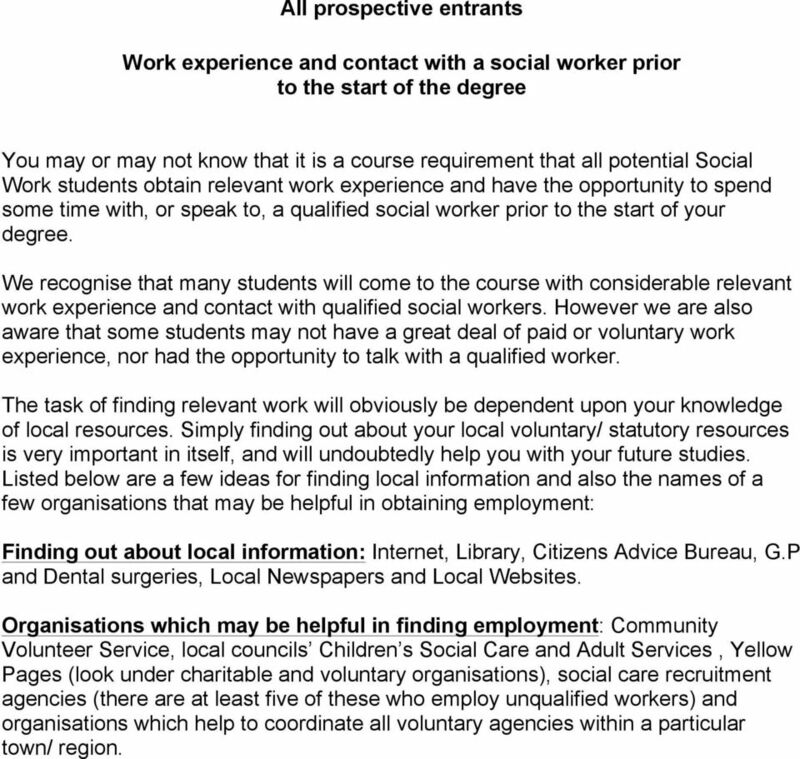 (Please see the attached dcument Wrk experience and cntact with a scial wrker prir t the start f the degree). Demnstrate that their understanding f scial wrk is infrmed bth by underpinning knwledge and by reflectin n their experience. Hld certificated qualificatins in Maths and English which are, at least, equivalent t GCSE (at grade C r abve) Demnstrate that they have Infrmatin, Cmmunicatin Technlgy (ICT) skills which are sufficient t allw them t begin bth study and practice and that they will be able t develp these skills during their prgress thrugh the curse. (Applicants withut such relevant skills will need t demnstrate that they have plans in place t acquire them prir t starting scial wrk training). Cmplete a health disclsure frm. Cmplete a declaratin frm regarding matters that include criminal cnvictins, cautins and reprimands and any disciplinary actin by emplyers, in rder t satisfy the prgramme that they are suitable t wrk with vulnerable children and adults. 5 All prspective entrants Wrk experience and cntact with a scial wrker prir t the start f the degree Yu may r may nt knw that it is a curse requirement that all ptential Scial Wrk students btain relevant wrk experience and have the pprtunity t spend sme time with, r speak t, a qualified scial wrker prir t the start f yur degree. We recgnise that many students will cme t the curse with cnsiderable relevant wrk experience and cntact with qualified scial wrkers. Hwever we are als aware that sme students may nt have a great deal f paid r vluntary wrk experience, nr had the pprtunity t talk with a qualified wrker. The task f finding relevant wrk will bviusly be dependent upn yur knwledge f lcal resurces. Simply finding ut abut yur lcal vluntary/ statutry resurces is very imprtant in itself, and will undubtedly help yu with yur future studies. Listed belw are a few ideas fr finding lcal infrmatin and als the names f a few rganisatins that may be helpful in btaining emplyment: Finding ut abut lcal infrmatin: Internet, Library, Citizens Advice Bureau, G.P and Dental surgeries, Lcal Newspapers and Lcal Websites. Organisatins which may be helpful in finding emplyment: Cmmunity Vlunteer Service, lcal cuncils Children s Scial Care and Adult Services, Yellw Pages (lk under charitable and vluntary rganisatins), scial care recruitment agencies (there are at least five f these wh emply unqualified wrkers) and rganisatins which help t crdinate all vluntary agencies within a particular twn/ regin. 6 Manifest fr Scial Wrk at the University f Bradfrd We believe that scial wrk must be cmmitted: T the prvisin f services which bring psitive change in the lives f individuals and cmmunities, and especially thse facing trauma, disadvantage and ppressin. T the nging develpment and active prmtin f plicies and practice which prvide psitive benefits fr vulnerable peple. T wrking alngside thers and in partnership with vulnerable peple t create a mre scially just sciety which endeavurs t meet the needs f all cmmunities and grups, and T wrking alngside thers and in partnership with vulnerable peple t challenge agencies and institutins whse plicies and practices have negative cnsequences fr vulnerable peple. As scial wrk educatrs, we will, therefre, in partnership with practitiners and agencies prviding practice placements, encurage students t develp: Practice which is infrmed by: Critical reflectin and analysis. Relevant underpinning knwledge and research. Service users needs and views. Scial wrk values and ethics. The practice experiences f clleagues and partners in scial wrk and ther agencies in bth the statutry and vluntary sectrs. Recgnitin that the prblems faced by mst service users are aggravated by, r have their rigins in, the inequitable nature f scial structures. 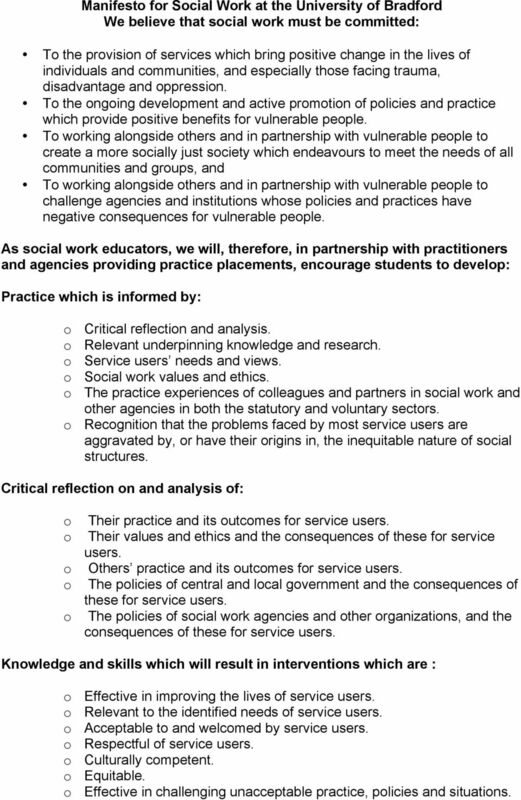 Critical reflectin n and analysis f: Their practice and its utcmes fr service users. Their values and ethics and the cnsequences f these fr service users. Others practice and its utcmes fr service users. The plicies f central and lcal gvernment and the cnsequences f these fr service users. The plicies f scial wrk agencies and ther rganizatins, and the cnsequences f these fr service users. 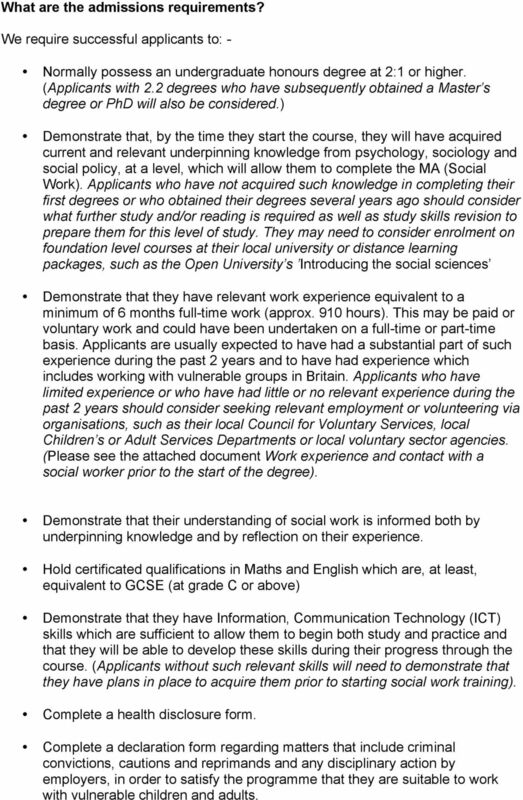 Knwledge and skills which will result in interventins which are : Effective in imprving the lives f service users. Relevant t the identified needs f service users. Acceptable t and welcmed by service users. Respectful f service users. Culturally cmpetent. Equitable. Effective in challenging unacceptable practice, plicies and situatins. This is the secnd article in a series f five written as resurce fr lecturers and candidates fr Prfessinal 2 exams. The series has as its gal the imprvement f exam pass rates at the Prfessinal 2 stage.